This is a 1 foot standard power Y / Splitter cable. 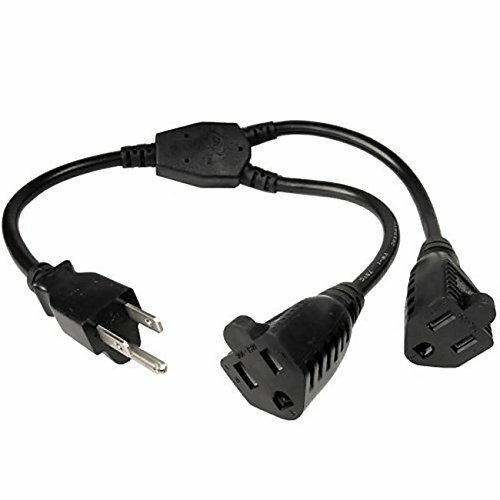 This power cable features the NEMA 5/15P (standard three prong power plug) to dual NEMA 5/15R (female) power cord. Use this cord to split a single power line to two lines. The jacket is durable and long lasting but flexible enough to wrap in tight spaces. The 18AWG pure copper conductor transfers maximum power. This cable operates on 125 volts and 10 Amps power. Operating temperature is 75C/167F. This power cable features the NEMA 5/15P (standard three prong power plug) to dual NEMA 5/15R (female) power cord. The jacket is durable and long lasting but flexible enough to wrap in tight spaces. Length: 1 foot. Color: Black. Weight: 0.44 lbs. Wire: 18 AWG. Other: Rated at 10 amp. If you have any questions about this product by Brandz, contact us by completing and submitting the form below. If you are looking for a specif part number, please include it with your message.